In what appears to be a diplomatic gesture, a jailed Chinese rights lawyer and activist was reportedly released by regime authorities on his 38th birthday, Sept. 14, just ahead of President Barack Obama’s meeting with the Chinese leader, Xi Jinping. A member of the Transition Institute, an underground Chinese think tank shut down in 2013, Guo Yushan was freed on bail, after nearly a year of detention. His colleague He Zhengjun, arrested in the same case, was also released. 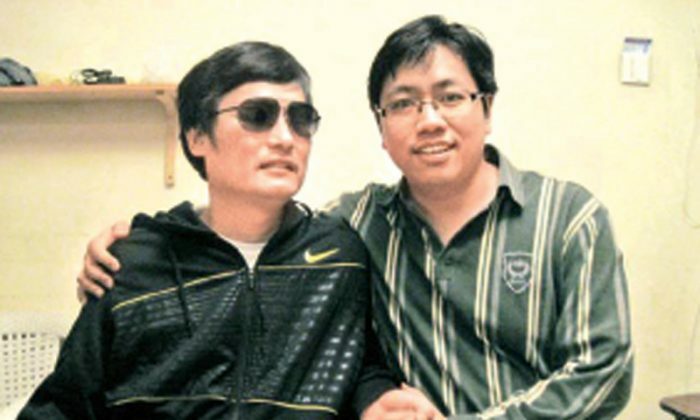 Guo is also known for assisting blind human rights activist Chen Guangcheng to escape house arrest in 2012. Chen now resides in the United States. Speaking to Voice of America, pro-democracy activist Hu Jia said that the releases of Guo and He are related to Xi’s upcoming U.S. visit. “It reflects the diplomatic results we expected from Xi Jinping’s trip to the United States,” Hu said. He Qinglian, a Chinese economist residing in the United States, had previously written that the Chinese regime might release political prisoners as an attempt to convey “sincerity” during the summit. The arrests of Guo Yushan and He Zhengjun last year came as part of the crackdown on dissident during and following the Occupy Central movement in Hong Kong, in which hundreds of thousands in the former British colony opposed Beijing’s attempts to control elections. Guo was detained in October 2014, but only formally arrested this January. Prior to that, he and his associates from the Transition Institute had been followed and monitored by police for years. Founded in 2007 by Guo and others as “Transition Social and Economic Consulted Ltd.,” the Beijing-based Transition Institute is known for its independent analysis and publications regarding Chinese socioeconomic issues. Famous scandals such as the tainted milk powder that killed or infected hundreds of thousands of infants across China, or the environmental and social consequences arising from the Three Gorges Dam project, were discussed openly through the institute’s work. Furthermore, Guo Yushan and the institute were linked to the nonpartisan “New Citizens Movement,” started by activist Xu Zhiyong, who advocates constitutionalism. In 2013, Xu was arrested and his movement dispersed. The Transition Institute had been highly regarded even by the National People’s Congress and other official organs. In July 2013, it was given a legal violation notice by regime authorities, who stripped the institute’s office of all items, including research data. Since then, the institute and its staff lay low, facing increased government scrutiny. But in October 2014, the police struck again when Lin Lisa, the girlfriend of one of the Institute’s members, was discovered to have printed material supporting the democracy movement in Hong Kong, according to Initium, a Hong Kong-based media agency. Lin and her boyfriend were quickly detained. Guo Yushan and other members were apprehended on Oct. 9 by the Beijing Public Security Bureau and criminal charges were laid. Guo and his colleagues were charged with “provoking trouble” and “illegal business” caused by the unauthorized printing and distribution of 19,000 books between 2007 and 2014. It was also reported by the South China Morning Post that the institute received financial support from foreign political parties and nongovernment organizations in Germany, Canada, and the United States. In April, a Hong Kong advocacy group for China’s human rights lawyers stated in a press release that the Transition Institute’s research and analysis, provided free of charge, had been highly regarded even by the National People’s Congress and other official organs. In May, after over half a year of detention, Guo Yushan had lost over 20 pounds, according to his wife and fellow lawyer Pan Haixia, Voice of America reported. He Zhengjun was only able to see a lawyer on Jan. 7, over a month after his own detention in late November 2014. Following this, police continued to interfere with their consultations, citing “the need to investigate procedures,” according to a report by Boxun, a Chinese-language news site based in North Carolina. Speaking to the New York Times in a 2013 interview, Guo Yushan had warned of growing risks for dissidents in China as the Communist Party has put more pressure on independent civic expression and political opposition. Chinese authorities have recently stepped up their suppression of the country’s growing legal community, the Communist Party’s rhetoric on “rule of law” notwithstanding. The authorities have no genuine interest in improving their human rights record. Lawyers defending clients who face political or religious charges, such as members of the persecuted Falun Gong spiritual discipline, are often stonewalled by court officials and police. In extreme cases the lawyers themselves are physically assaulted or violently removed from court. A report by Chinese Human Rights Defenders said that over 900 human rights activists had been detained in 2014, a 72 percent increase from the previous year. The dissident Hu Jia told Voice of America that of the prominent Chinese activists currently in custody, Guo Yushan’s was not the most egregious case of arbitrary detention. According to a report by the Guardian, lawyer Yu Wensheng said the Chinese regime intended to use imprisoned activists and attorneys as “bargaining chips” in its diplomacy with the United States. “The authorities have no genuine interest in improving their human rights record,” Yu said. For all the Chinese regime's rhetoric on the so-called "rule of law," all manner of obstacles have been thrown in the paths of human rights lawyers. Why Do Chinese Lawyers Bother to Defend Corrupt Officials? Representing purged “tigers” in court isn’t glamorous or pays well, but Chinese lawyers do it anyway.